white tea was first discovered during the Tang Dynasty, about the sixth century, and soon became the choice of the royal courts.White tea has undergone much change since 1885, when specific varieties of tea bushes were selected to make Silver Needle白毫银针 and other specialty white teas. Modern white tea appeared after that. Chinese export of these fine white teas began in 1891. White tea is named from its unique characteristics, covered with white hair.白毫The unique quality is obtained as a result of a special processing procedure of “nofrying and no crushing.” The annual production of white tea is relatively small, just2,000 tons, about 0.1% of that of black tea. White tea is mostly produced in Fuding,Zhenghe, Jianyang, and Songxi of Fujian Province in China, and this accounts formore than 90% of the annual world production of white tea. 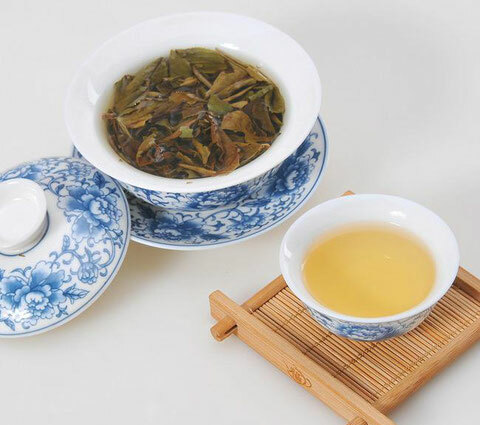 white tea is manufactured with minimal treatment, and it is rapidly steamed and dried, leavingthe leaves fresh.White tea is harvested when the buds on the trees are still covered with finewhite hairand the leaves have not yet fully opened. After plucked, fresh tea leavesare sunshine withered and dried, and the leaves are kept relatively fresher than thoseof green or black tea. With a lighter and sweeter taste after processing, white tea iscloser to fresh tea leaves than green tea, and is far different from the other varieties of tea.Usually, white tea is processed with only two procedures, withering and drying.Sometimes, the same processing method, such as sunshine drying, can be lookedupon as both withering and drying. The earliest manufacturing method is sun dryingfor white tea. Modern diverse white tea can be manufactured by three methods ofsun drying, airing, and basket frying. White tea can be manufactured in the spring,summer, and autumn, but not the winter. 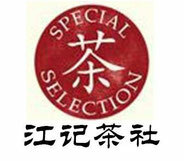 Usually, spring white tea has premiumquality, autumn white tea is next, and summer white tea is the lowest grade. The processing method in Fuding is more prevalent. The first step for Silver Needleprocessing is sunshine drying. The buds are spread evenly on sieves or witheringmats right after they are plucked from tea trees, and insolated directly under the sun.Keeping for one whole day under the strong sunshine in spring is sufficient, uponwhich the white tea might be nearly dry. 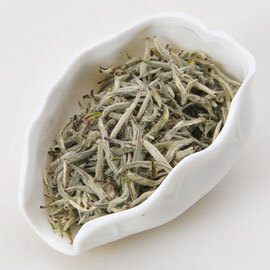 The nearly dried white tea can be baked onslow fire until fully dried. It will take about 30 minutes for 250 g of tea buds to dryat 40–50°C in a baking basket.In the case of hot and wet days, insolating for 2 days is needed. After the tea budsare nearly dried, they can then be baked on slow fire. For rainy or foggy days, directbaking with slow fire is necessary.The processing method in Zhenghe is a little different from that in Fuding. Airingunder the shadow or mild sunshine prior to direct sunshine drying is practiced.Mostly dried tea buds are moved under strong sunshine to dry completely. 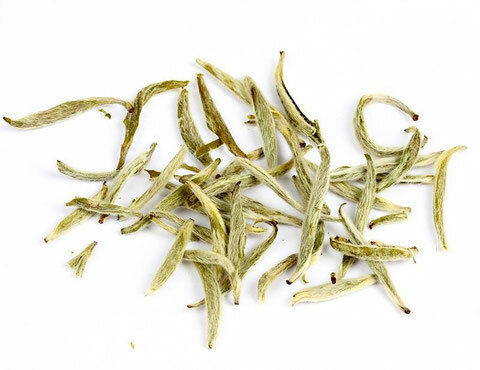 The durationfor the whole process is often 2–3 days.Dried white tea, covered with white hair and silver shining, has a bulky shapeand vivid color and luster富有光泽. The quality of white tea produced in different areas is different due to the existing differences in the processing methods practiced. Fuding Silver Needle appears silver white and tastes clear and delicious, whereas Zhenghe Silver Needle appears silver gray and tastes fresh, brisk, and luscious or full body. White Peony is made from the bud and one or two leaves.Although Gongmei and Shoumei are the lower grades and made from different materials, their processingtechniques are similar to White Peony, as described here.White Peony can be processed with the two simple steps of withering and basketdrying（萎凋及焙干）. Withering is the key step that determines the final quality of white tea. There are usually three withering methods for White Peony: sunshine withering, airing, and low-temperature withering.Airing is the most used method for White Peony. The requirements for airing inspring are 18–25°C, and relative humidity (RH) of 67–80%. Usually, a temperatureof 30–32°C and an RH of 60–75% are more acceptable for summer and autumn airing.The airing time is often 52–60 hours.Low-temperature withering could be used instead of airing during rainy days.The withering room is heated by the pipeline, keeping at 20–32°C and RH of.65–70%. A temperature of 29–30°C is most suitable for withering. The witheringtime for airing is often more than 36 hours. When tea bud and leaves are half dried,they can be basket dried twice.Sunshine withering could be used on sunny spring days, too. Fresh leaves can beinsolated暴晒 for 25–30 minutes under slight sunshine during morning or at dusk, at 25°C and RH of 63%. Tea leaves should be moved into a prewarmed withering room. Ordinarily, two to four times of sunshine withering is best for processing of White Peony.However, sunshine withering is not favorable in the strong sunshine in summer. After withering, basket drying is the last processing step for White Peony. Timelydrying can keep the color and taste good, prevent variation, and enhance the aromaof tea. The basket drying of White Peony can be done over 15–20 minutes at firetemperature of 70–80°C. If tea leaves are only half dried, basket drying should bedone twice复焙, with the first drying at 100°C and the second at 80°C. A baking machine could also be used instead of baskets, with operating parameters参数 similar to those of basket drying.